For those looking to buy a rifle or shotgun, the length of the stock is an important consideration. A stock that is too long or too short will be awkward and uncomfortable for the shooter. Also, managing the recoil from the gun will be more difficult when the stock is not the right length. For people of “average” arm length, most off the shelf guns will do just fine. I’m a bit taller than average, so my arms are a bit longer than average, which means that the standard stocks on some guns aren’t long enough for me. For example, the FN Herstal Police Shotgun that I bought had a stock that was about 0.75″ too short for me. To correct this I simply added a recoil reducing pad to the stock, which added a bit of length and made the gun fit comfortably against my shoulder, although I could also have purchased a replacement stock. Smaller individuals who would like a smaller stock can usually purchase one that is not quite as long, or take their gun into a gunsmith for modification. Those who live in an area that does not ban telescopic stocks as an “assault weapon” feature may also wish to consider that feature, as it can allow people of different size to comfortable share a single gun. 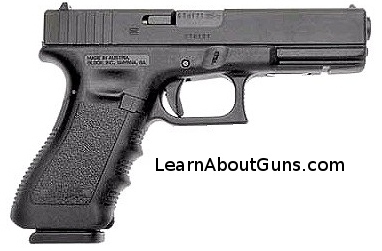 When selecting a handgun, the width and length of the grip becomes the primary issue insofar as fit is concerned. Those with smaller hands will want to make sure that they can fully and comfortably grip revolver or pistol, and hang on to the gun as it recoils. Those with larger hands will want ensure that they can fit all (or enough) of their fingers on the grip. For example, I have pretty large hands, and some subcompact pistols have short grips that leave my pinkie finger hanging in the air. I don’t find this to be a problem in most cases, but it is something to be aware of. I took a neighbor who never shot a gun in her life to the firing range. It was not surprising; at 60 one would think there would have been an opportunity to at least shoot once. I introduced the 380 ACP, 9mm C9, 40 ACP, and 45 ACP; all with standard pressure rounds. After firing each, she said the 40 ACP was hard to grip, kicked hard, and hurt her hand; the 45 ACP was difficult to grip, kicked, but was easy to handle; the 9mm was fun but was still a little too large; however, the 380 ACP was just right. The 380 ACP was easy to grip, smooth to shoot, and voted the best. The size of the gun should match the size of the shooter. For me, I will take the 45 ACP all day long.